"We need to take big and bold leaps, not baby steps, forward for gender equality""Women are called cooks, men are called chefs, women are called seamstresses, men are called designers. Same job, different pay"
The fifty-eighth session of the Commission on the Status of Women (CSW 58) just concluded at the United Nations (UN) headquarters in New York. This year it focused on a theme very close to my heart—“Challenges and achievements in the implementation of the Millennium Development Goals (MDGs) for women and girls.” The aim for the session was to produce a document that’d outline a development agenda where women’s rights, empowerment, and gender equality were pivotal. This in turn would serve as a blueprint for the Sustainable Development Goals (SDGs) which will replace the MDGs as the UN target in 2015. These 8 goals include 21 targets with 60 indicators that member-states need to reach in order to achieve UN standards for development. To me the member-state’s quest to achieve the MDGs is like a non-athlete attempting a pentathlon without training. Just as the almost criminally optimistic novice would collapse due to exhaustion or die trying to achieve an impossible feat, nearly a decade and a half after that deadline to tick off the MDGs their achievement seems to be a mirage instead of the credible finish-line for UN members. This is so because gender inequality persists. To me achieving gender parity is boot camp for achieving the MDGs. 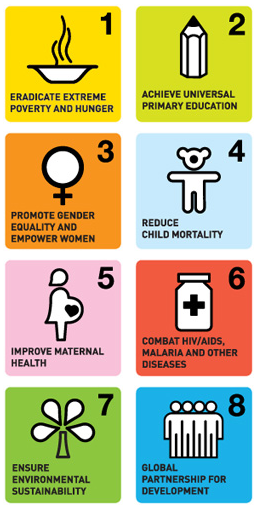 Gender equality is a means for accelerating progress on all MDG targets, for example eradicating poverty, reducing maternal, newborn and child mortality, reversing HIV and ending hunger. At the same time, progress in achieving all the MDGs, for example improved access to water and sanitation, and achieving full and productive employment and decent work for all, promotes gender equality. The gains therefore from investing in gender equality are substantial, both to women and girls themselves, and to societies more broadly. The cost of not acting is also immense. ü 17 million girls will never enrol in school due to factors such as safety concerns and social, cultural and economic barriers. ü In 2011, there were 774 million illiterate adults, a decline of just 1% since 2000. The number is projected to fall only slightly, to 743 million, by 2015. Almost two-thirds of illiterate adults are women. In a world where, according to the Netherland’s mission’s statistics, 39,000 girls under 18 are married off every day, we need to refocus attention and funds on keeping girls in school as it has a multiplier effect in protecting girls from early marriage, controlling maternal and infant mortality as well as enabling educated and empowered young women control the timing and number of children. The Invest in Girls campaign is a timely initiative from this point of view as it is focussed on ensuring access to education for girls. Investing in teachers is also central to the quest to educating the girl child. E.g., in nearly a third of countries, less than 75% of primary school teachers are trained according to national standards and the challenge of training existing teachers is worse than that of recruiting and training new teachers. Another point emphasized in the conference was the fact that gender equality is not a women’s issue but an issue for us all. The He for She campaign of UN Women launched on March 8, International Women’s Day reached 19 million users of social media within a week and focussed on getting influential men doing their bit to bridge the gender gap. The gender indicators—52 standard indicators for gender equality, together with the 9 standard indicators for measuring violence against women—approved by the UN Statistical Commission in February 2013 would serve as a guide for data compilation internationally and help formulate the roadmap to gender equity. Information and Communication Technology (ICT) and the internet were hailed as catalysts for advancing women’s rights and empowerment. In a “smart and wise knowledge society for all” where women and girls have access to and are able to use ICTs achieving the MDGs is a certainty. Beacons of hope discussed at the conference include Empowerwomen.org, an ICT tool to drive the women’s agenda in the economic sphere that’s helped over 40,000 women and men around the world. Another revolutionary ICT programme is “She Will Connect” a partnership with Intel for digital literacy training for young women in countries in Africa. The commission culminated by calling for women’s access to opportunities and resources and a post-2015 agenda where the safety, human rights and empowerment of women are critical. The unified call was for an enabling environment for gender equality where economic, social and environmental policies promote substantive equality for women and girls supported by gender-responsive institutions across all sectors. A wonderful ideal to focus on in the quest for a better world! As they say when you aim for the stars even if you miss you’ll hit the moon! Storify images & tweets from participants during United Nations Commission on the Status of Women on accelerating progress on the MDGs for women and girls (CSW 58).